As mentioned in this post, my search for a dream Chanel is finally ended. This is what I ended up with – a 2.55 classic flap lambskin with silver hardware. I’ve been searching for this perfect purse for almost 4 months. It’s easy to get caught up in moments and settle for just OK. This has happened to me a couple of times when searching. I was able to talk myself out of it both times. $2000 is a lot to spend on a bag. Hence, I wanted to make sure that I make the right choice. - A true classic flap and not a wallet on chain (WOC). WOC is a little too small for my needs. - Since it’s a classic bag, black was my first choice of color. - I was specifically looking for a flap with silver hardware. I found many classic flaps with gold hardware but didn’t come across many of them with silver hardware. Most of my jewelry is in the silver family so I had my mind set on a flap with silver hardware from the beginning. - One of the toughest things to do was to stay on budget (especially for a classic flap). I did stay under budget, but just barely. All in all, it was still a pretty good buy. Special thanks to those who have helped me with questions and given me your opinions. You ladies are the best! If you dont mind me asking, did you get it from a reseller? Perhaps you can recommend a trustworthy one. I am so afraid to buy high end bags from ebay to find out I paid for a knock off. 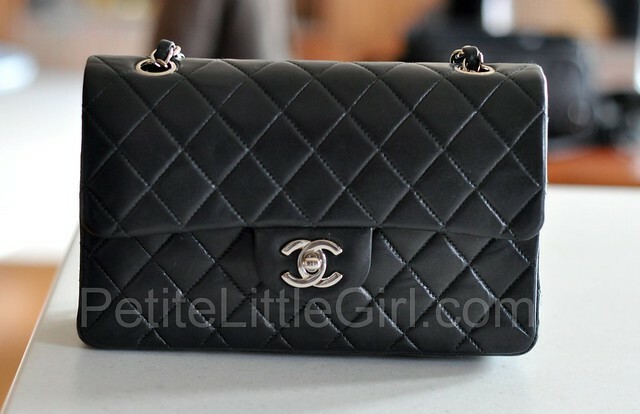 love, love, love the Chanel bag, i'm looking for one myself, very similar to this, but in cavier material.I can't wait to get my little hands on one! Did you purchase preowned as well? I believe its the best thing to do right now since the current retail prices are insane!! Aweeeeeeee YAY Sydney! So so so so HAPPY for you! She's perfect and totally YOU!!! Congrats! It's beautiful! You were so patient throughout this whole process and thoroughly did your research, which I give you mad credit for! congrats, sydney! looks so gorgeous. if i were to get a chanel bag, i think that would be it! Oh my, I love her and she looks PERFECT carried by you! Definitely worth the wait to find her. Gorgeous! So impressed with your research and patience! Sydney, Cece really is gorgeous! What is her size and exact model, just for reference, and for us to compare her to the ones mentioned in your previous post? Enjoy your date night with her & hubby! You mentioned that you found many classic flaps with gold hardware. If you don't mind me asking, which store did you find them at? I'm looking for one with gold hardware, but it's so hard to find one in my area (SoCal). Congratulations on your first Chanel! Love your dress! Aw, Sydney! I am so happy for you! Congratulations on finding your dream Chanel! Black with Silver is THE classic look. You look fabulous with her on. congrats! great choice, youre gonna love her! such pretty classic chanel bag ! CeCe is Gorgeous! and it looks great on you. I totally agree with you on getting a black purse bc I truly think that years down the road, it will still look so classy and elegant. eek! congrats sydney!! your new cece baby is GORGEOUS! she's def a true classic through and through i see you wearing her for years to come!! congrats! I stumbled onto your blog and was drawn to your Chanel post. I recently owned a classic flap too and it has been my dream bag for years. I can't tell you how upset I was with all the price increase and kicked myself for waiting so long. I've always wanted to buy 1 on my Europe trip which never materialized. Instead I got my friend to buy when she was in Paris coz I figured the next time I go to Europe, there might be a price increase again. Owning a Chanel classic flap in black or beige in gold hardware and lambskin has been my longest dream. However, I did lots of research and decided to get the caviar in the end. Also like you, since I wanna get a classic I chose black. Plus the hubby was against beige. I know what you mean when you say the feeling of holding one is indescribable. The feel, the smell, all adds on to the sight. And you know what? I informally called my bag CeCe too.. as in coz of the CC clasp. LOL!